A rare summer resident in Wisconsin, the northern mockingbird is often seen so sporadically around the state that searching for evidence of breeding is not unlike looking for a needle in a haystack. In fact, Sam Robbins wrote in 1991 that on average eight sightings were reported each year since 1960. With that knowledge, Goose Pond Sanctuary staff felt very fortunate to spot a northern mockingbird atop a tree along the eastern edge of the Hopkins Road Prairie on June 25th. 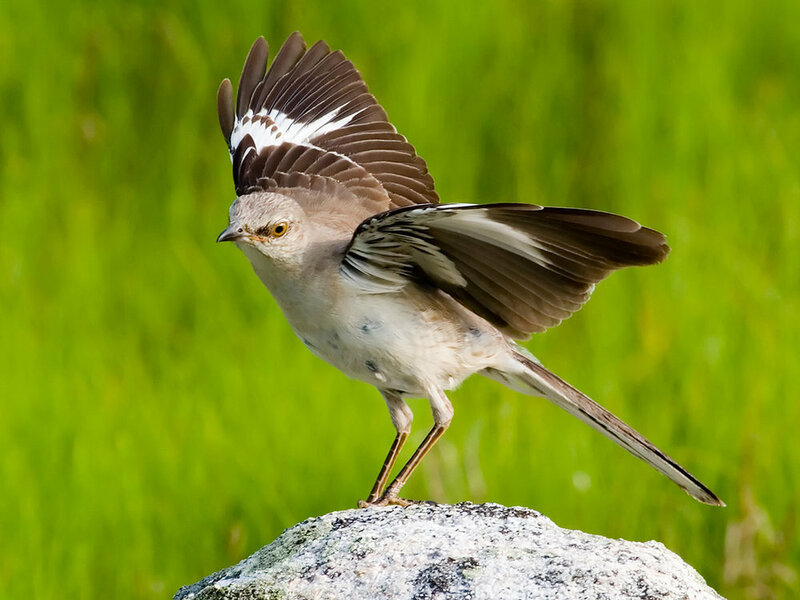 The northern mockingbird is fairly easy to identify and frequently gives a "wing flash" display, where it half or fully opens its wings in jerky intermediate steps, showing off the big white patches. We frequently think of the northern mocking bird as a southern species. This might be one species that increases in Wisconsin with climate change. The bird was heard before it was seen, stringing together many different calls in a seemingly endless effort – a characteristic of the species. An adept mimic, the northern mockingbird is able to perfectly replicate many of Wisconsin’s beloved bird calls, including those of the American robin, eastern bluebird, mourning dove, tree swallow, whip-poor-will, and meadowlark. Each individual continues to add new sounds to its range, and an adult male may learn around 200 songs in its lifetime. Northern Mockingbirds sing all through the day, and often into the night. Most nocturnal singers are unmated males, which sing more than mated males during the day, too. Nighttime singing is more common during the full moon. Several days after the first sighting, David Shealer, a black tern researcher from Loras College, spotted a northern mockingbird on a telephone wire near the intersection of Highways 22 and 51/60 in North Leeds, less than a mile northeast of Hopkins Road Prairie. Despite our best efforts to locate the bird, this was the last sighting near Goose Pond Sanctuary. Northern mockingbirds are often seen singing high atop vegetation, fences, and telephone wires, but prefer feeding in areas with open ground and shrubby vegetation, like hedges, fruiting bushes, and thickets. In early summer, Sue Foote-Martin, co-manager of Goose Pond Sanctuary, spotted a northern mockingbird at their property in Columbia County that has an easement held by Madison Audubon Society. That made three sightings in one summer in Columbia County – not too shabby. Columbia County has a history of northern mockingbird nesting activity, with two of the seven confirmed nesting sites found within a few miles of Goose Pond during the six years of the first Wisconsin Breeding Bird Atlas. Nests can be found in trees and shrubs 3-10 feet off the ground, but may be even higher. Hopefully our shrub plantings at Goose Pond will attract northern mockingbirds in the future. Atlas workers will have to be extremely vigilant and very lucky if they hope to find the needle in the haystack.